What should be a simple recipe was not so easy to master. The Glen-Mor Restaurant method used a double-boiler to combine the butter and brown sugar. We tried the double-boiler approach but could not get the consistency correct. The instructions below are easy to follow and the result was very tasty. Cut the greens off the carrots, leaving 1 inch remaining. Peel the carrots. Add the carrots to the glaze and stir to evenly coat. 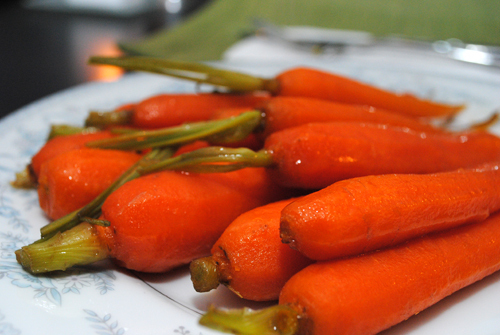 Cook carrots in the glaze for 15 to 20 minutes or until carrots reach desired tenderness.